Marsha Hewitt's wall constructions and free-standing sculptures have a mythic, ritualistic quality that stirs the viewer's imagination and reminds us of the magic and awe of the natural world. 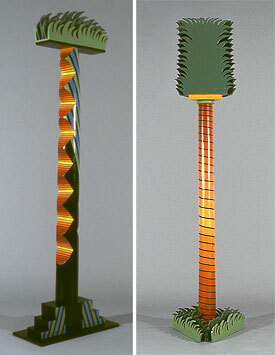 She makes brightly colored, exuberant sculptures comprised of tree branches in the rough and machine-doctored wood. Small pieces designed to hang on the wall and large, free-standing pieces work together to create an enchanted forest, a magical space apart from ordinary consciousness where trees dance and mythos comes alive. Individually, each piece has its own personality, inviting the viewer to experience and play with the boundary between the mysterious and the mundane. Underlying the whimsical feeling of the work is a strong concern for the relationship of our technological society to the natural world. The fragility and beauty of the finished pieces reflects the transformation of natural materials that at the same time respects their inner nature. 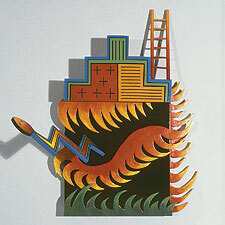 Creation of this body of work was supported in part by the Massachusetts Arts Lottery administered by the Cambridge Arts Council. In addition to the exuberant, yet formally elegant painted wood trees and environments, Hewitt will also exhibit some furniture. Two eight-foot thrones, The Emperor and Empress, were originally designed as a set for a dance production called "The Fool's Fable," based on the Tarot deck. 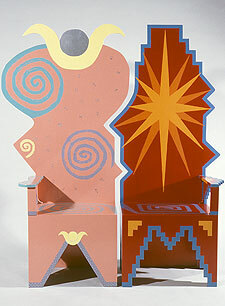 The two thrones are painted in the colorful style of the polychromed trees and fit together like a puzzle. They can also be turned around to display columns to the sun and moon on the back. Marsha Hewitt's work has been seen in over 70 museum exhibitions, most notably an exhibit organized by the DeCordova Sculpture Park and Museum at the Federal Reserve Bank in Boston, Massachusetts, and galleries in New York City, Chicago, and Boston. She received her MFA from Massachusetts College of Art and her BFA from the University of Michigan. Her artwork is in the collections of Boston University, Chevron Corporation, Fiduciary Trust, Godwin Proctor, Northrup Corporation, and Software Options, among others. Marsha Hewitt was a full professor in the Art Department at Keene State College in Keene, New Hampshire, for the past 13 years and recently retired to create her own artwork full-time. Stop by on September 2 to find out what she's doing!